The Slaughtneil players celebrate with the John McLaughlin Cup after defeating Ballinascreen at Celtic Park. Slaughtneil captain Patsy Bradley kisses the John McLaughlin Cup after the Derry County Senior Football Championship Final in Celtic Park. 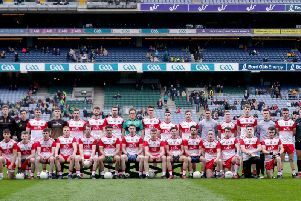 Four goals and four successive Derry Senior Championship titles for a Slaughtneil side whose dominance of the Oak Leaf club scene shows no signs of abating after they brushed Ballinascreen aside at Celtic Park on Sunday. The Emmet's 10-points victory over a 'Screen side who had put it up to them for the majority of the first half only served to illustrate the gap Slaughtneil have opened up on the chasing pack who are struggling to bridge a gap that looks wider than ever. Ballanscreen set up to frustrate the champions but found themselves three points down before four minutes had elapsed as Padraig Cassidy, Shane McGuigan (free) and Se McGuigan all got on the scoreboard. Against the past masters of game management, a three point deficit, even in the opening minutes, is usually terminal but 'Screen did well to recover and grow into a first half which made a mockery of pre-match predictions of a dour, defensive struggle. Ballinascreen positioned Anton Kelly on the edge of the square, a tactic Slaugthneil replied to by sending Patsy Bradley back in to cover him but without any balls being sent in, Kelly was redundant for most of the opening half. Instead it was the Emmet's front men who were causing havoc with runners from half-back constantly punching holes in a 'Screen rearguard heavy on numbesr but still finding themselves over-worked such is the abundance of attacking talent that Mickey Moran's men possess. 'Christopher 'Sammy' Bradley in particular was causing problem, as he drifted around in a free role that 'Screen struggled to contain. Bradley made it 0-4 to no score on give minutes but 'Screen responded with points from Shane Mulgrew and Ronan Murphy to halve Slaughtneil's lead. It was a good spell for Screen but that's when Slaughtneil are at their most dangerous and just as Liam Donnelly's team began feeling more confident on the front foot, Slaughtneil, hit them with the sucker punch of the first goal. Se McGuigan picked out Brendan Rodgers' run and the Derry back broke the 'Screen defensive line with relative ease to put himself clear. As always with a Slaughtneil runner, there was a man off the shoulder and when Rodgers drew, Niall McGlade off his line, there was Chrissy McKaigue to accept an easy pass and finish to the the back of an empty net. That was 1-04 to 0-02 with only 11 minutes gone and already the final had an ominous look about it. Yet, 'Screen stuck to their task, hitting the game's next three scores through Philip Bradley, Brendan Herron and a Mulgrew free to bring it back to 1-04 to 0-5 by the 19th minute but Slaughtneil always looked in control. Sammy Bradley extended the lead out to three points but just as neutrals were beginning to get excited about the prospects of a close game, Slaughtneil hit with a brilliant second goal and this time McKaigue was the provider. Breaking clear on the right, McKaigue found his path to goal blocked but still picked out Shane McGuiagn inside. The forward still had plenty to do but produced a ferocious shot on the swivel which found the top corner and put his side six points clear at 2-05 to 0-5. That had become 2-08 to 0-07 by the half-time whistle and already it looked only a question of the winning margin. To emphasis the point, Slaughtneil hit 1-01 inside the opening 90 seconds of the second half, a lovely low finish into the net by Keelan Feeney from a Sammy Bradley pass adding to an earlier Shane McGuigan point. It was game over but 'Screen deserve credit for continuing to press forward but when it's not your day, it's not your day as Benny Heron found out from the penalty spot after Michael McBride was fouled. Heron's spot kick was well hit and headed for the bottom corner but Emmet's keeper Antoin McMullan dived brilliantly low to his left to turn it away for a '45'. 'Screen finally did get a goal of their own when Anton Kelly fisted McBride a centre into the net but at 3-10 to 1-08 it was hardly any consolation. A fourth goal duly arrived from Shane McGuigan but it owed everything to the persistence of Cormac O'Doherty for refusing to give up on a ball most other players thought had gone wide. A late Ballinascreen dismissal on a second yellow card for Philip Bradley only confounded 'Screen woes but they had been second best from a long way out. With the game won, Slaughtneil maintained a level of control which merely confirmed their dominance, a dominance which has now stretched past it's fourth year in Derry with little sign of any one being in a position to knock them off their perch. Slaughtneil: Antoin McMullan; Paul McNeill, Brendan Rodgers, Karl McKaigue; Francis McEldowney, Chrissy McKaigue (1-0); Keelan Feeney (1-0); Patsy Bradley, Padraig Cassidy (0-1); Cormac O'Doherty, Paul Bradley (0-1, 1f), Meehaul McGrath (0-1); Shane McGuigan (2-4, 1f), Se McGuigan (0-1), Christopher Bradley (0-3). Ballinascreen: Niall McGlade; Philip McGlade, Dermot McBride, Eoghan Gilmore; Kieran Conway, Michael McShane, Phillip Bradley (0-2); Paul Burns, Anton Kelly (1-0); Carlus McWilliams, Shane Mulgrew (0-4, 4f), Brendan Herron (0-2); Benny Heron (0-1), Ronan Murphy (0-1), Barry Grant (0-1).